We Introduced The Hooklift To America! We offer a complete range of services at the customer’s disposal, including a Parts Department, Technical Assistance, and Training Services. Our staff represents 45+ years experience in Sales, Installation & Repairs to the hydraulic hooklift system. We have at our disposal a complete engineering department to provide technical data, drawings and support with special applications. Today the Marrel group assumes a leading position in America. Marrel is continuously developing its line of equipment, integrating the newest vehicle-related developments as well as logistics and maintenance technologies. Investing in development has enabled Marrel to remain the leading supplier of equipment to the industrial transportation industry across the nation. Ampliroll is designed to pick up, dump, transport and unload your containers safer and faster. That means larger profits for you. 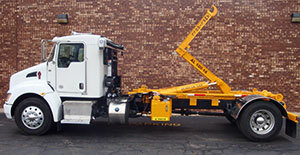 No matter what your specific distribution needs, let us help you find the right hooklift system. Contact Us Today!